Every year, TCA selects Turkey study tour programs from across the country to receive its's Turkey Study Tour Grant. Since 2011, the TCA Turkey Study Tour Grant has supported educational study tour programs to Turkey by American universities and educational institutions. It subsidizes participation costs for students and provides a general incentive for institutions to choose Turkey as a study tour destination. The call for applications goes out in January, and applications are due in March every year. 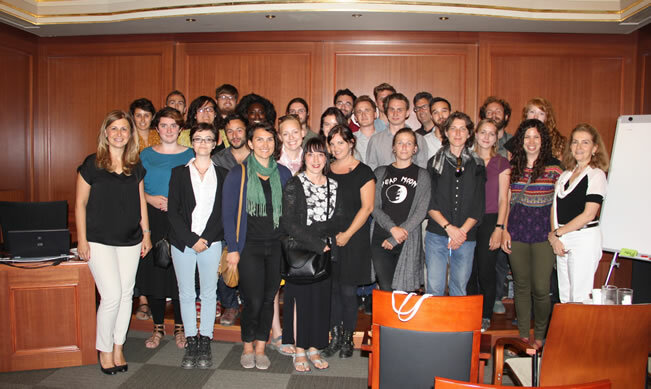 2015 TCA Turkey Study Tour Grant recipients from Evergreen State University visit the TCA Istanbul office. The Turkish Coalition of America (TCA) is pleased to announce that it is accepting applications for the 2016 TCA Turkey Study Tour Grant. Established in 2011, the TCA Turkey Study Tour Grant supports educational travel programs to Turkey by American universities and educational institutions. It subsidizes participation costs for students and provides a general incentive to institutions to choose Turkey as a study tour destination. To apply, interested institutions are advised to submit a letter of intent to scholarships@tc-america.org. All applications must follow the proposed letter of intent format, which can be found on the TCA website. Only institutions planning an educational study tour program to Turkey between April 2016 and April 2017 may apply. All applications are due Wednesday, March 23, 2016. All applications must follow the Grant Letter of Intent Format. Any available program advertising materials. TCA opens applications for the Study Tour Grant every year in January. Applications are accepted until March, and grant notifications will be made in April. The grant period is for study tour programs occurring between April of the year of application and the following April. Note: Minority students who participate in a TCA-sponsored Turkey Study Tour Program are not eligible for additional funding under the TCA Scholarship Program for Students of Minority and Heritage Communities. TCA is pleased to announce that after receiving a record number of applications in 2015, it has awarded nine grants to faculty-led study tour programs organized by American universities. The TCA Study Tour Grant program supports educational tours to Turkey and this year will provide a total of $41,350, which will benefit 105 students. Now in its fifth year, the TCA Study Tour Grant program provides an incentive to American institutions of higher education to choose Turkey as their study abroad destination. TCA’s grants are designed to support study tours by decreasing costs for students and increasing participation in programs in Turkey. Buffalo State - SUNY - 10 students will participate in an interdisciplinary program that explores Turkish history and culture. Evergreen State College - 27 students will study Turkey’s history from the ancient empires to the Ottomans to the modern Turkish republic. University of Arkansas - 13 students will focus on landscapes, urbanism, and culture. Texas A&M University - 23 students will participate in a political science program in Istanbul. University of Colorado - 8 students will study Turkey’s multiethnic history. University of Nevada-Reno - 16 students will learn about Turkish society from historical, anthropological, sociological, and political perspectives in two separate sessions. University of Minnesota - Duluth - 8 students will study arts and visual culture in Turkey.